October 3, 2018: Using the NASA/ESA Hubble Space Telescope and older data from the Kepler Space Telescope two astronomers have found the first compelling evidence for a moon outside our own Solar System. The data indicate an exomoon the size of Neptune, in a stellar system 8000 light-years from Earth. The new results are presented in the journal Science Advances. The hunt for exoplanets—planets outside our own Solar System—provided its first results only 30 years ago. While astronomers now find these planets on a regular basis, the search for moons orbiting exoplanets wasn’t successful—until today. The candidate moon, with the designation Kepler-1625b-i, is unusual because of its large size; it is comparable in diameter to the planet Neptune. Such gargantuan moons are unknown in our own Solar System. “This may yield new insights into the development of planetary systems and may cause astronomers to revisit theories of how moons form,” Alex Teachey, a graduate student who led the study, explained excitedly . Like its moon, Kepler-1625b is also bigger than its counterparts in the Solar System. The exoplanet is a gas giant, several times more massive than Jupiter . It orbits its parent star at a distance similar to the distance between the Sun and Earth, which puts it—and its candidate moon—at the inner edge of the habitable zone of the star system . 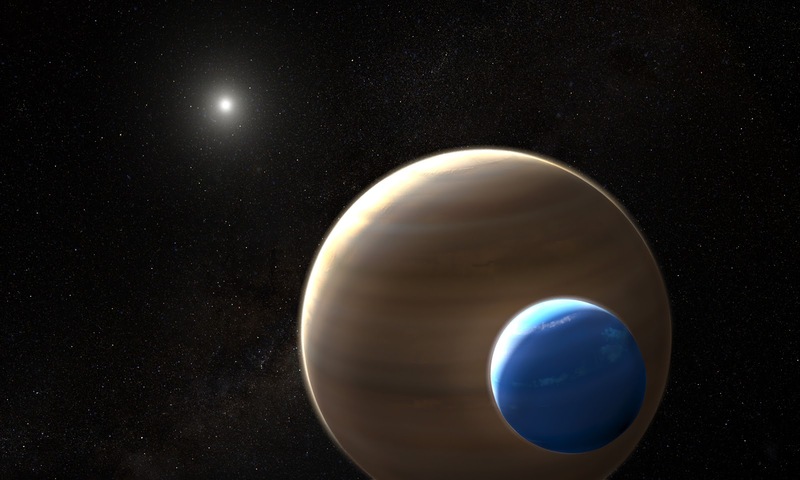 The planet was observed by Hubble before and during its 19-hour-long transit. After the transit ended, Hubble detected a second and much smaller decrease in the star’s brightness approximately 3.5 hours later, consistent with the effect of a moon trailing the planet. “It was definitely a shocking moment to see that light curve—my heart started beating a little faster and I just kept looking at that signature,” David Kipping described his feelings. Unfortunately, the scheduled Hubble observations ended before the complete transit of the moon could be captured. In addition to this second dip in the light curve, Hubble provided compelling supporting evidence for the moon hypothesis by detecting the planet’s transit more than an hour earlier than predicted. This is consistent with a model of the system in which the planet and its moon orbit a common center of gravity, causing the planet to wobble away from its predicted location .